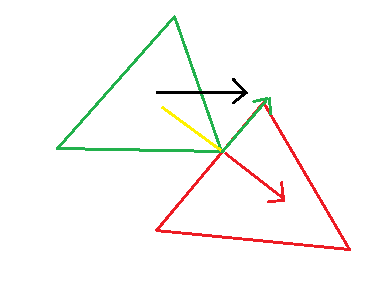 Say I have a multitude of 2D polygons floating about on a plane. These polygons can have any side count and aren't necessarily regular. 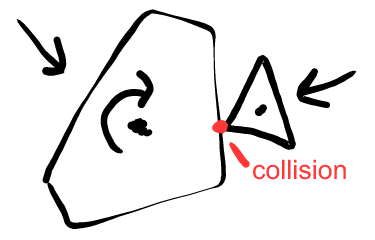 Assuming I know absolutely everything about the polygons (area, collision point, location, velocity, rotation, angular velocity... etc) how to I calculate what happens to two polygons after collision? I.e. what will their resultant velocities and angular velocities be after collision? If not an exact solution, what resources could help me learn how to accomplish this? This is kinematics, which allows us to deal with each kind of motion (rotation, translation) separately. Basically you get the new velocity of object B by projecting object A's original velocity on to the negative version of the normal and you get A's new velocity by dividing B's new velocity from A's original velocity. To get the result, as I wrote above, do the same with A being static and add the resulting velocity vectors together. This should solve the translation problem, now onto rotation. where M is the mass of the static object. Now take this angular velocity and add it to the current angular velocity of the static object and you're done. Not the answer you're looking for? Browse other questions tagged physics collision-resolution or ask your own question. How to add rotation to two particle collisions? 3D Ball Physics Theory: collision response on ground and against walls? Why does physics not behave consistently in Unity?